Don't touch that dial! This recycled cardboard stand gives your iPad the look of a retro TV. 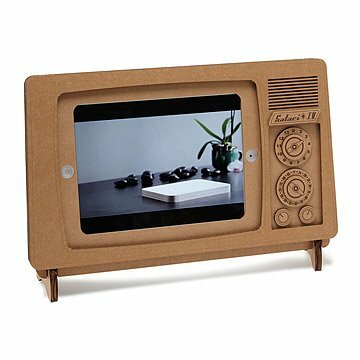 Don’t touch that dial—this recycled cardboard stand gives your iPad the look of a retro TV, recreating the golden days of tuning in with family. Designed by Luis Rodrigalvarez. Made in Charlottesville, Virginia. Fits iPad and iPad Air. Please note: this is not a protective case. This is quite clever, and relatively easy to assemble. The only downside is that the cardboard and double-sided tape both smell very strongly of chemicals. After having it for a couple of weeks that has mostly dissipated, but it was really powerful in the beginning. We keep it in the kitchen. Binge watching a lot of Netflix while cooking and cleaning during the holiday. It looks great sitting on the counter! Getting a lot of comments, good comments! "It's cool"! We purchased 20 of these to give to clients that work in the Media industry. They were a huge hit. Assembly is required which is a little annoying but once you put it together it's really cool! This is a very cute novelty, but the instructions to put it together were not very clear. I had to obtain a video posted online to figure the jigsaw puzzle out. It comes in several panels that have to be punched out in order to build the display. There is a small amount of double sided tape included, but I was short 3 small squares and had to buy more to finish the project correctly. This was a gift to a geek who loves TV and tablets. So it was a perfect fun throwback to 20th century using 21st century tek. looks great. unknowns. but the money is small so risk is too. great so far! For someone who has everything, this was a unique gift. It holds the iPad really well and makes it into a conversational piece. Everyone who has seen it has commented on how cute & functional, yet nostalgic it is.